Even with the latest and greatest technology in the swimming pool industry, the need for a residual sanitizer in the water remains essential. A residual of pool sanitizer is the first line of defense against germs, as its primary function is disinfection. The secondary function of these chemicals is to rid the pool of bather waste (aka non-living organics, oils, sunscreen, etc.) through the process of oxidation. This article will break down a few of the most common types of pool sanitizer, discuss their pros and cons, and how they interact with other chemistries in the pool. Like usual, we are simplifying complicated chemistry here so it can be understood by the masses...if you want more specifics on these chemicals, we encourage you to research them for yourself. The most common sanitizer, of course, is chlorine. Chlorine comes in many different forms, so this article will name the types of chlorine most often used in pools. Beyond chlorine, however, are a few other types of sanitizers--namely bromine, biguanides, potassium monopersulfate and dissolved metals such as silver or copper. For this article, we have chosen not to dive into talking about secondary disinfection systems, because they are not residual sanitizers. We can discuss those in another article. At Orenda, it is our opinion that chlorination is the most practical and reliable form of sanitation for a swimming pool. We are wary of any "new technology" that eliminates the need for chlorination...or markets their product as such. While there are some great secondary systems out there, as well as some alternatives that work for many people, health and safety of recreational water is our number one priority. That said, we are also minimalists when it comes to pool chemistry. The more additives and equipment you put in the system, the more variables. We like to keep things simple and effective. Not all chlorines are compatible. In fact, mixing different types of chlorine can be extremely volatile and even lethal. For example, calcium hypochlorite (cal-hypo) and liquid bleach can combust into flames when mixed. Pick one chlorine and stick to it. If and when you want to switch to a different form of chlorine, do so with the help of an expert, and be sure to remove any leftover containers of the previous chlorine from your truck or storage facility. Never store two different types of chlorine near each other. Err to the side of safety, rather than convenience. Elemental chlorine is a halogen gas, and is an extremely strong--and volatile--oxidizer. For safety reasons, gas chlorine is outlawed in most places. 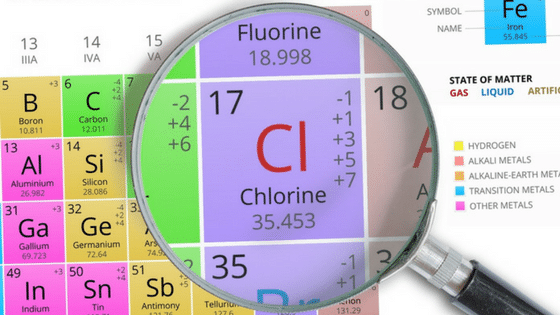 For swimming pools, therefore, we must use more stable forms of chlorine with other elements. 1. Liquid Chlorine (sodium hypochlorite), aka "bleach"
very common in both residential and commercial pools, and readily available in every pool market. For pool service professionals, liquid chlorine is popular for many reasons, and low cost is one of them. Liquid chlorine is also ideal for automated chemical feeders. Cons: Shelf life for liquid chlorine, depending on circumstances, is not great. It deteriorates in a matter of weeks, and in the presence of direct sunlight, that could be a matter of days, or even hours. This is why many pools use stabilizers like cyanuric acid to give chlorine a longer lifespan in the water. This deterioration of chlorine is accelerated in the presence of metals such as iron. Another con of liquid chlorine is its high pH. Most pools will need to add acid to neutralize the pH after chlorination. The lower the pH of the water, the more effective chlorine's killing speed, but with a pH of 13, every time you chlorinate, the pool's pH will tend to rise. Warning: Never mix acid and chlorine directly. The fumes are toxic. Cal hypo comes in tabs and powder, but most commonly tabs. Pros: Cal Hypo is an incredible pool sanitizer, and gives the added benefit of calcium to your water. Particularly for pools with plaster surfaces, cal hypo helps saturate the water with calcium to reduce the risk of etching. Measure calcium in the fill water and plug it into the an LSI dosing calculator. You will find that higher calcium not only increases the LSI score, but also buffers pH in the same manner as total alkalinity. After all, total alkalinity is just a combination of carbonates, bicarbonates and hydroxides. 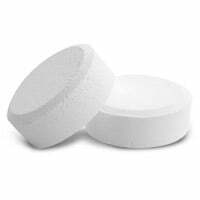 Calcium hydroxide, the secondary byproduct of cal hypo (after HOCl) is the same compound that leeches out of plaster during the curing process, known as plaster dust. Cons: Cal Hypo comes in the form of powder or tabs; tabs require a feeder to be introduced to the water. 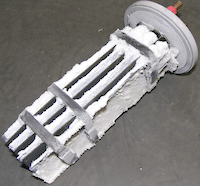 These feeders tend to get clogged with calcium and organic waste buildup, sometimes referred to as "chalking". The bigger issue with cal hypo, however, is its volatility. It is a very strong oxidizer and fire hazard, and when it is near certain chemicals (other types of chlorine, for example), it can spontaneously combust. Never, and we repeat, never put any other type of chlorine in a cal hypo feeder. Warning: Even introducing cal hypo directly to organics (body oils, ammonia, human sweat) can cause a fire. Always use gloves and protective equipment when handling it, and keep it safely stored. Pros: Lithium is a stable form of chlorine with a longer shelf life than liquid bleach or cal hypo. It is not a fire hazard, and also boosts total alkalinity when added to the water, as well as raising the pH. Lithium hypo is fast-dissolving and can be introduced as a powder, or pre-dissolved in a bucket before introducing as a liquid. Cons: Lithium hypochlorite is not very common, primarily because of cost, and low strength. For residential pools it may be adequate, but it is generally regarded as an insufficient pool sanitizer to handle the demands of a busy commercial pool. Yes, salt pools are chlorine pools. The sodium in the salt (sodium chloride, NaCl) is broken apart by means of electrical current. This process creates usable chlorine in the water, with the byproduct of heat. For more information on the myth that salt pools are not chlorine pools, read this. The reaction to create chlorine from saltwater is very similar to how sodium hypochlorite (bleach) is created. We won't get into the detailed chemistry, but know that salt pools ARE chlorine pools. Pros: Constant feed of chlorine, usually 24/7, or at least daily. Also, after the equipment is installed, chemical costs are very low (with the exception of constantly having to lower the pH with acid or CO2). Cons: Unable to produce more pool sanitizer if demand increases, and requires users to shock the pool. Also, if the pool is not electrically bonded properly, ionization occurs, which accelerates corrosion very quickly. Salt cells also produce heat, which invites calcium scale to form. The other con to saltwater is the total dissolved solids are high...generally 3,000 on the low end. Higher TDS leads to cloudy water, and as water evaporates out during those hot, sunny days, the salt stays behind. Pros: Neutral pH, long shelf life, fast dissolving. Dichlor is commonly used as a shock and a startup chlorine to introduce some cyanuric acid to the water...but not too much. It is great for fiberglass and painted pools because the pH is neutral. Cons: Dichlor is a fire hazard, and is not easily introduced via an automated feeder system due to its fast-dissolving nature. It adds cyanuric acid to the water, which is good up to a certain point...but continual use of dichlor will keep increasing the levels of stabilizer in the pool. It mutes pool sanitizer efficiency and eventually can become a problem. Pros: Trichlor is affordable and slow dissolving. It is popular for year-round residential pools by putting tabs in the skimmer or floater. Sometimes they are put in an in-line chlorinator feeder. It is also introducing stabilizer (cyanuric acid) with the chlorine, so it survives in the sun longer. Cons: Trichlor is volatile, and explosive when met with cal hypo. Trichlor is also very acidic, which can corrode metal components within the pool system, especially if the pump is not circulating water 24/7. Metals can dissolve when met with stagnant water with highly acidic trichlor. Eventually that metal content will fall out of solution and stain. Given what we know about the LSI, trichlor should never be used in cold months, as it's pH almost guarantees etching and corrosion when the water gets cold. We will discuss chlorine alternatives in Part 2 of this article. We hope you gained value out of this information. At Orenda, we know each chemical serves its own purpose. As advocates for best practices--and minimalism--it is important to use the right chemical for the right application. 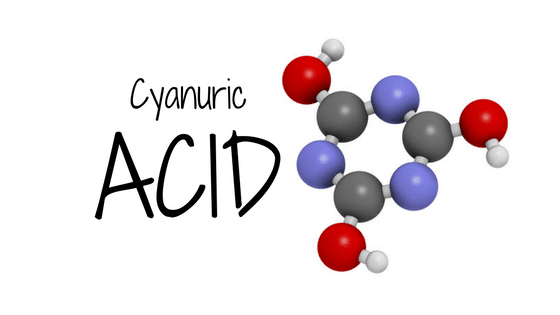 For example, cyanuric acid is a substance to protect chlorine from sunlight...it should never be used in an indoor pool. Cal hypo is a great pool sanitizer when used in the right application, but it is primarily used for commercial pools with automated feeders. Such an application is impractical for most residential swimming pools, unless used as a 'shock'. Cal hypo may not be a fit for your pool if your pool has "hard water", meaning high calcium hardness. If you would like more advice on which chlorine is most appropriate for your pool, contact us for guidance. We're happy to help.